Planning a wedding can bring up a whole lot of questions and often leave you in a panic of wondering what details you might have missed. Since we love you, we care for you and we don’t want you pulling your hair out with frustration, we have compiled a lovely, list of Frequently Asked Questions. The following Q and A section specifically pertains to the Water Oasis, however, it could be useful for booking at other venues (but why would you want to). A: Our main season runs from June to September. The rates vary depending on the time of year and day of the week. Please contact us for a quote. A: Yes. Rates are lowered for the off months of May and October and mid-week events. A: So many wonderful things! In addition to access to the entire venue for the day, we have a variety of table and chair options available to you. These options and numbers will be laid out in a packet you will receive after booking. We take care of setting up your table/chair options for ceremony and reception, as well as, taking them down at the end of the night. We also offer a great planning and information guide called the Oasis Extras. 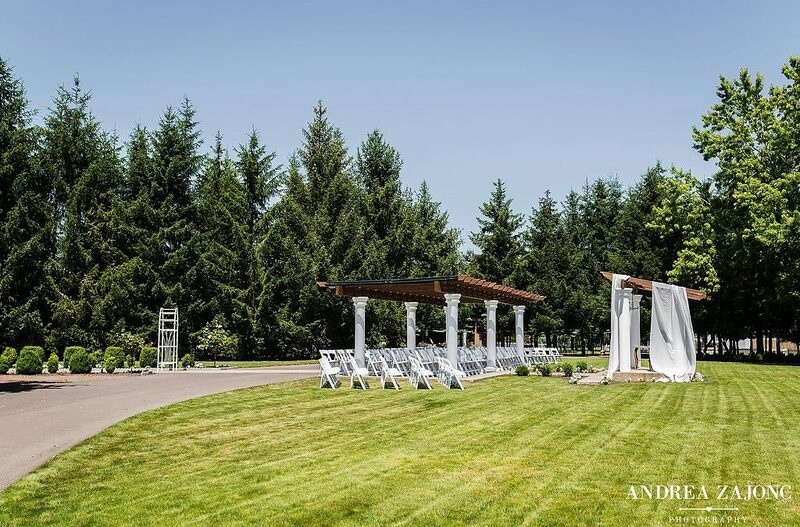 It is filled with information regarding measurements of our ceremony areas, reception space, property layout and so much more. Best part, it’s all included in your rental price! A: Additional services such as site flip and others are available at an extra rate. Rental items are also available and will be attached to your post booking email or you can find them here. In addition, we are working with an excellent rental company to put together some choice add-ons for all our beautiful people. A: Each event space on the property has its own restrictions and set up options. During a site visit, we can discuss generalizations and preferences. However, our max is 300. A: Yes. After booking, we will email you a packet with many options for event layouts. If you do not find any of them to be suitable, we are open to discussing other options. Our layouts are suggestions for optimal set up, but they are just that, suggestions. We always refer to our clients for final decision and love to help them create a layout that suits their needs. A complimentary meeting to help finalize the layout is INCLUDED in your rental fee. Any changes will be updated to the final map and copies will be sent to the vendors of your choice. A: Rehearsals are held on the Thursday immediately before your event date. The day of the event, you will have access to the venue starting at 10am and ending at 11pm. If you need additional time in the morning for set up/decorating, we can discuss this option as well (fee applied for additional hours). Q: Can we come by and visit the venue before our wedding date to show family and vendors or to have our own private planning session? A: Yes. We are more than happy to schedule a visit for you. We do ask that you do not drop by, but rather schedule a visit due to our full calendar during our open season and our closures during our off season. If you would prefer an unassisted site visit (no Venue Manger present), we ask for a (3) three day notice to be sure the venue is open (no events or construction). We offer a (1) one hour time frame for unassisted visits with no restrictions/limits to the number of visits you can make. An assisted site visit is offered with your paid venue fee. It is (1) one hour long and in addition to the included (1) one hour Final Walk Through visit. A: The event manager will be available by phone in the early hours. Two (2) hours prior to the ceremony start time, they will arrive and remain on site until the end of the night to close up the venue. A: Yes. In fact, we provide complimentary parking for up to 115 cars. For guest counts over 150 we do require parking attendants, whether that be supplied by the client or going through one our Preferred Vendor, Bridge City Parking. Shuttle services are also available to rent in the form of a trolley, bus, or vans. A: Two public restrooms are available to use and located right outside the tent next to the Salons. The Salon & Lounge each have their own private restrooms, as well. A: Yes. We have 2 handicap parking spots in the parking lot, closest to the Salons. All of our bathrooms (including the Salons) are ADA accessible. Almost every accessible area on the property is paved with the exceptions of the Countryside Meadows and Shady Grove. Q: Are there dressing quarters for the wedding party? A: Yes, we have a lovely Salon and Lounge available. Both are very well suited to meet your wedding preparation needs. Check them out here. A: YES! We will provide you with a list of our favorite vendors and you can also find out more information about them on our Feature Friday blogs. Just search for the specific vendor name here. Some of the perks you can enjoy with our Preferred Vendors are, site knowledge, discounts, and complete and total reliability. Q: What type of kitchen services are provided for caterers? A: We have a catering prep area behind the Salons that is covered and has ample space for caterers to set up and prepare you meal. All of our Preferred Caterers are familiar with our set up and know the venue Rules & Regulations. If you decide on a caterer off list, we will go over these details with them and a $500 fee will be applied. A: Yes. Our clients are required to purchase a ‘Day of Event Insurance policy’. The policy protects you in the event there is damage to the property or equipment, as well as, additional coverage for wedding related items you can personally choose. A: Our Venue Manger is on site to monitor the venue for things like: smoking in designated smoking areas, children are monitored by adult supervision near the water and gardens, no outside alcohol is consumed by guests in parking lot, and general venue concerns and safety issues. Q: Is there a noise ordinance in place? If so, what are the restrictions? A: Yes. Due to the fact that we are an outdoor venue, the decibel limit set per the county, is 100 decibels (which is REALLY LOUD). Most DJ’s stay within an 85 – 95 decibel range. Our time for last dance is 9:30 pm, which gives you enough time to prepare for your grand exit and have guests depart by 10 pm. A: In the case of rain, we provide complimentary side walls for our Pavilion Tent. If needed, the tent would serve as a backup rain plan option to hold ceremony as well as reception. We also have a few propane heaters and misters available to rent. A: For a postponement, we try to our best to work with clients in these circumstances. We can attempt to find an alternative date within the same year or postpone to the following year. The venue fees already paid being able to transfer or not will depend on whether the current date can be secured for another wedding/event. In the event of a cancellation, we will determine if a partial/full refund is available. The determination is dependent on the amount of deposit, when the cancellation happens (how far out from the wedding date) and IF the date can be secured for another wedding/event. A: Depending on how far out in advance you book your date, we offer selective payment options regarding the venue deposit and additional payments. A: Final payment is due four (4) weeks prior to the event date. Please let us know if we did not cover all your questions or concerns. We’d be happy to discuss them with you.